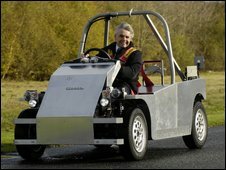 An electric car created by the McLaren F1 'supercar' road car designer Gordon Murray has been unveiled. Three prototypes of the T.27 model will be developed over the next 16 months. The manufacturing process, called iStream, has received £9m of investment, half of which came from the government's Technology Strategy Board. iStream plants can be just one fifth of the size of a conventional car factory, as the cars are not made from stamped steel. All the parts are designed by computer and welded together rather than being stamped out of metal sheets, explained David Bott, director of innovation platforms at the Technology Strategy Board. "It's a very radical approach to manufacturing," he told the BBC. "Usually you talk about high value, or low carbon, or resource efficient manufacturing - this ticks all those boxes." The T.27 car is designed for city or town use. Its predecessor, the T.25, weighs 600kg - half the weight of an average small family car. "Cars don't tend to be heavy because of safety; they tend to be heavy because of luxury," added Mr Bott. "The tubular frame of the T.27 is designed to absorb energy. It will pass all the relevant safety tests." Gordon Murray, F1 designer and inventor of iStream, has been refining the technology since 1999, and has recruited former colleagues from his days at F1. "The thinking is similar to McLaren's," he said. "It's all about efficiency and being lightweight, but in urban vehicles." The most expensive part of any electric car is the battery, he added. So in order to be energy efficient, they need to be lightweight. The T.27 can reach 60 miles per hour and is designed to travel up to 100 miles in between recharges. "It's for commuting, picking the kids up, that sort of thing," said Mr Murray, who drives a Smartcar. "We're not saying get rid of your station wagon but it's where car use must go - rather than having a couple of big cars in the family."